Makeup is fun because it’s the equivalent of having art supplies, but for the face! There’s plenty to choose from, and you can never have enough of it because there’s always something new to try. Even with the invention of beauty sponges, silicone sponges, and so many more, nothing beats the original function of a good and trusty brush. Soft and incredibly lush, the brushes at Brush & Co are said to be premium yet affordable cruelty free makeup brushes. There are videos that you can use as reference to how good these brushes feel, and the sets contain everything you need from small brushes for your eyes to big and fluffy powder brushes. Marketed as Muslim and vegan friendly, this local brand is slightly on the higher side but for a set of high quality brushes that comes with a pouch, it’s totally worth every penny. Brushes aside, you can also get their version of a sponge and brush cleaner and it’ll still be cheaper than an entire set of brushes from Sephora! Any makeup junkie knows that Real Techniques make great brushes that are even better than high-end brands and we’re glad to tell you that this store has it all. 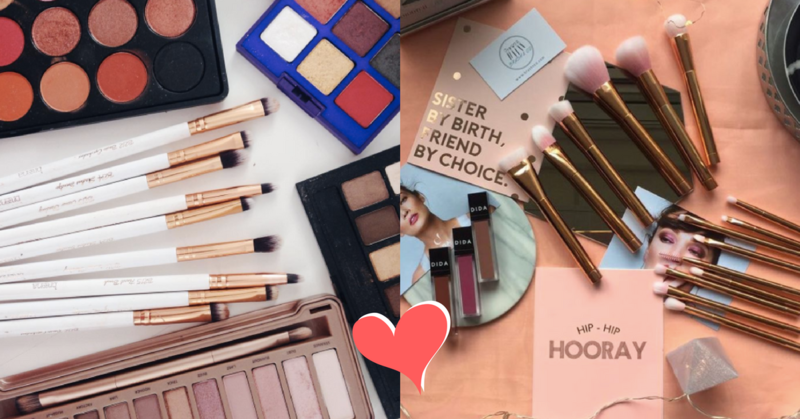 If you’ve been on a hunt for brands like BH Cosmetics, and even Beauty Blender sets, you can also find them here under reasonable prices. If you’ve seen those cute unicorn brushes floating around Tumblr and Pinterest, good news is that Velvetinnie opens pre-orders for them under a pretty steady price. Choose from a variety of sets and be prepared to get a bunch of questions from friends who can’t help but admire your new makeup brushes. Fans of Zoeva and Sigma brushes rejoice! Makeup Allure carries the beloved brand’s signature brushes that you can’t miss out. Known for being one of the best brands in the realm of makeup brushes, you can get them for half the market price here so we definitely recommend this store. The brand initially has two staple items: Face Luxe Brush and Eye Essential Kit, which you can still get. But what’s cool about this store is that they’ve expanded so you can even get their gorgeous range of Velvetcreme liquid lipsticks that are all the rage right now. So get the whole package here because they’re that good!